The Medical Imaging & Technology Alliance said manufacturers will add a color-coded warning system to give health care providers clear warning when they are doing scans that give patients potentially dangerous doses of radiation. A CT or computed tomography scan gives doctors a view inside the body, often eliminating the need for exploratory surgery. 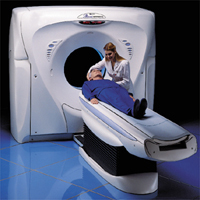 But CT scans deliver a much higher radiation dose than conventional X-rays. A chest CT scan exposes the patient to more than 100 times the radiation dose of a typical chest X-ray. High doses of radiation can cause skin burns, cataracts and other injuries. The new safeguards would apply to machines made by General Electric, Toshiba Corp, Hitachi Ltd, Siemens and Philips. The changes, which would be phased in starting this year, would provide a yellow alert screen when the dose is higher than expected. It would also offer a red alert warning when a patient is about to be given a dangerous dose of radiation. The system would also allow hospitals and imaging centers to set their machines to prevent these scans from being done.